These cinnamon rolls taste like the iconic autumn drink! Tender pumpkin dough flavored with coffee and filled with gooey cinnamon spirals—what’s not to love?? It basically tastes like a big cozy bear hug for breakfast, but without the guilt of store-bought cinnamon rolls! Leftovers will keep for at least one week if stored in an airtight container in the refrigerator. In a large bowl, stir together the warm milk, coconut sugar, butter, and salt. Stir in the yeast and wait 10-15 minutes or until the mixture smells fragrant. (It’s okay if it doesn’t turn bubbly or frothy!) Stir in the instant coffee and pumpkin purée until the coffee has completely dissolved. Sprinkle the pumpkin spice and 1 ½ cups of flour on top, and stir until completely incorporated. If the dough is still wet, continue stirring in flour 2 tablespoons at a time until the dough begins to pull away from the sides of the bowl. To prepare the filling: stir together the coconut sugar and pumpkin spice in a small bowl. On a clean, well-floured surface, roll the dough out into a 16x10-inch rectangle. Brush with the melted butter, leaving a 1-inch border on the two longer sides. Sprinkle with the filling sugar mixture, leaving a 1-inch border on the two longer sides again. Carefully roll up the dough into a log, starting at one long edge and rolling towards the other one. Pinch the ends to seal. If the dough won’t stick together, gently brush the second longer edge with water before pinching to seal. Slice the log into 12 pieces using dental floss (recommended; see Notes below) or a sharp serrated knife. Place the rolls into the prepared pan, and cover the pan with a clean towel. Set the pan in a warm, draft-free spot, and let the rolls rise for 45-60 minutes or until doubled in size. Preheat the oven to 350°F. Bake the cinnamon rolls for 17-20 minutes or until the filling is bubbling and the sides feel firm. Cool in the pan for at least 10 minutes before serving. I highly recommend using a 9”-round springform pan! Springform pans have taller sides than most traditional cake pans, so this allows your cinnamon rolls to rise properly without touching the top of the towel. Brown sugar may be substituted in place of the coconut sugar, but the rolls will no longer be clean-eating friendly. I haven’t had good luck substituting gluten-free flours in this recipe. 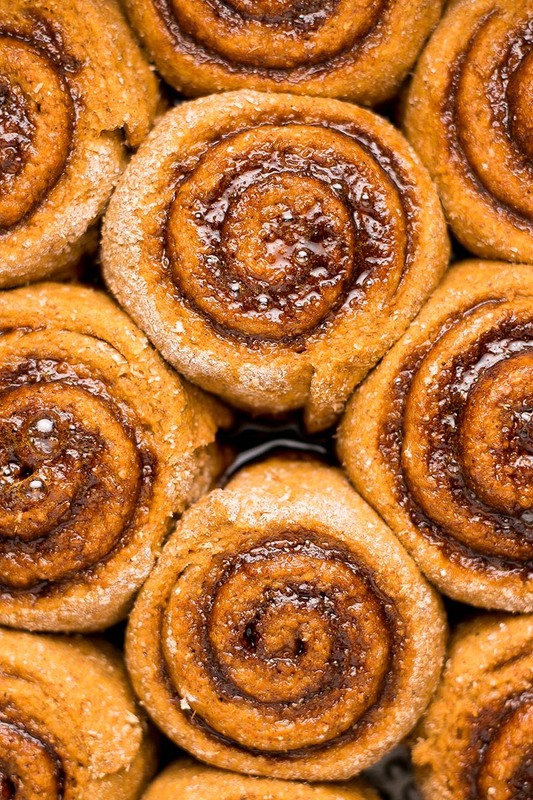 The cinnamon rolls don’t rise the way they do with wheat-based flour due to the lack of gluten. Hi Donalee – Yes. It may have a different moisture so just keep an eye on how your dough feels in case you need to add more liquid or less flour.